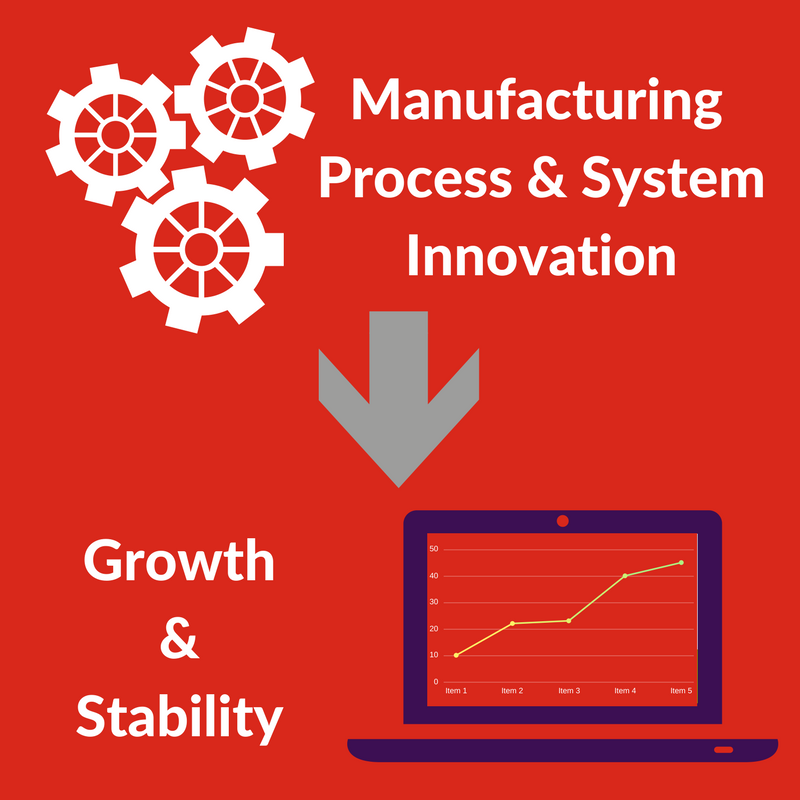 How an ERP System Can Facilitate Innovation in the Manufacturing Industry. 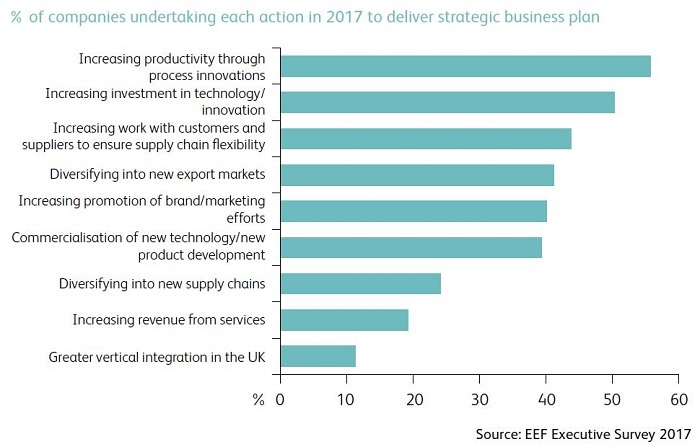 Last year The UK Manufacturers Organisation published a report highlighting the areas within manufacturing that were thriving and the areas in need of focus. It stated that research and development investment has been insufficient in comparison to other industries. In order for manufacturing in the UK to thrive in the coming years and successfully navigate through the potential economic challenges, finding areas for innovation should be considered essential. There are lots of good reasons to innovate, but primarily it drives competitive advantage. 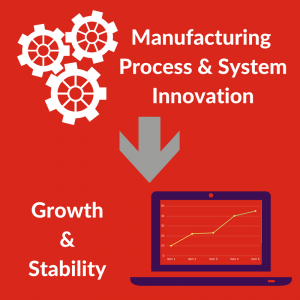 So what’s ERP systems got to do with manufacturing innovation? They’ve been around for decades after all. Not particularly innovative or cutting edge technology. Most manufacturing business leaders would agree that innovation should absolutely be a focus for them. But often the reality of day to day operations makes it a struggle for it to become a priority. Aside from cost, a key barrier to innovation is finding the time and space for teams to focus on innovation activities. How do manufacturing companies break the cycle of getting stuck on just the business as usual activities? One way is to drive optimisation and productivity of the business systems and business processes that underpin the day to day operations. The list can go on and on. And across a whole organisation can add up to a significant amount of time, cost and a waste of brain power. How much of a difference would it make to your organisation if the business as usual activities were automated, efficient and effective? So your key resources were freed up to focus more on strategic and innovative objectives. Often we see manufacturing innovation projects being shoe-horned in to people’s workloads where they’re already maxed out and stressed out. It’s not really a good starting point for people to embrace and deliver the benefits of innovation. Often it ends up that neither the BAU nor the innovation projects are getting done particularly well : BAU is at risk and the innovation projects are half-baked. So the objective is to get to a status where you can have the confidence that resources can focus on innovation – but not instead of or to the detriment of BAU. An optimised ERP system should be a platform that supports business growth. So in answer to the earlier question of what ERP has to do with manufacturing innovation: A properly optimised ERP system with aligned people and processes can facilitate innovation for manufacturing businesses by enabling the time and space required. Productivity can be increased through process innovation. 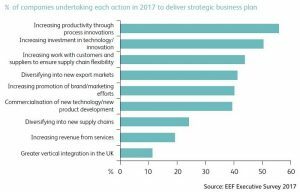 The EEF survey for manufacturing strategy 2017 highlights that nearly 60% of manufacturers are increasing productivity through process innovation. So it’s a two-fold benefit for innovative manufacturers. Business process innovation in itself drives up productivity. But an optimised ERP system supported by effective and efficient business processes also facilitates other types of innovation such as product innovation and service innovation. There are obviously always risks to innovation. But it could be argued that there are bigger risks to manufacturing businesses if they don’t innovate. So get the core business operations optimised so that there’s time and space for innovation.